Well guys... It finally happened. They called for a winter storm in Nashville, and mother nature finally delivered. SO. As a result... I'm stuck inside. For the second day in a row. I can't *really* complain too much though, because we haven't lost power, we haven't lost internet, and I've gotten a lot of work done. That being said, I am going slightly stir crazy, so I thought I'd take a moment to break from the norm and talk to you about something that's important to me. I've been a photographer for about 5 years now, and it has been a crazy journey of evolution, frustration, growth and never-ending learning. What I photograph now, isn't always what I used to photograph. How I photograph now, isn't always how I used to photograph. It all started back in 2010. I don't know if she knows this, but Krystal Mann was a huge reason why I finally decided to pick up a camera. I got married to my husband, Keith, back in 2010, and I refused to hire anyone else but Krystal as our wedding photographer. Krystal's husband is Keith's best friend, so I had been following her work for some time, and I couldn't quite put my finger on WHY I loved her work so much, vs. all of the photographers local to my area in Pennsylvania, but I knew it was better. I knew that it had a feel and an emotion to it that no one else seemed to be able to capture. So with that, I convinced my husband to let me hire Krystal, since she and Kyle would be flying in from Nashville for our wedding anyway, as Kyle was Keith's Best Man, and she worked her magic. 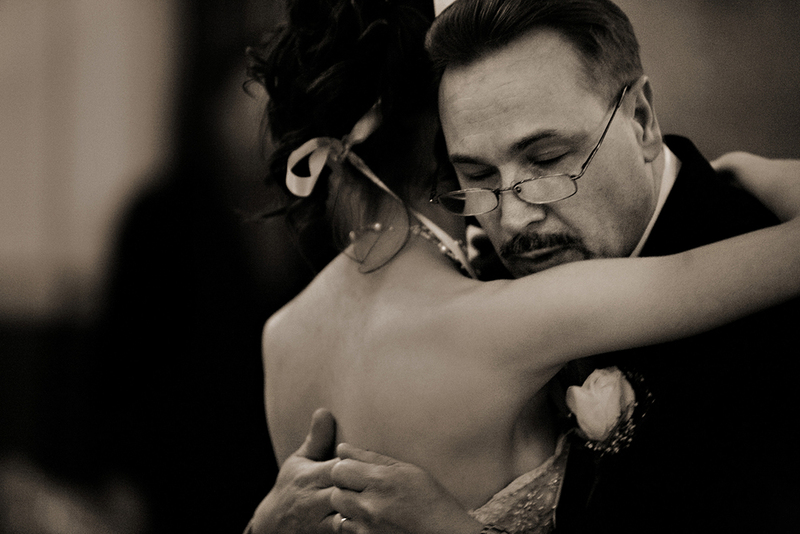 I think one of my favorite moments that she captured was this photograph of my father/daughter dance. I was a daddy's girl growing up and this really pulled at my heart when I saw this image. I don't know what it was about Krystal's work that finally convinced me that I needed to pick up a camera, because at the time I didn't even really have a desire to photograph portraits, but it did. In the Spring of 2010, I bought a camera and I set out to learn everything I could possibly learn about photography. My main focus for learning and my major desire at the time, was to get good at concert photography. Keith is a drummer, and as a result, I always had access to the stage at his shows. I photographed nearly every single one I went to, and started posting to an online photography forum asking for critique. Eventually I connected with someone who started to give me very sound advice about my images. It turned out though, that Pierre Bourgault wasn't just some nice Canadian dude on a forum, but that he was also an incredible concert photographer. Either way, at the time when I *was* pursuing the idea of concert photography, Pierre was a great inspiration, support, and mentor through that period of my photographic life. As I continued on my track as an aspiring concert photographer, I continued to watch Krystal Mann's work, and even worked with her as a second shooter from time to time. Once again, there was something about the way that Krystal connected with her clients and got them to connect with each other, that pushed me to want to start being able to do that with people. So I started shooting portraits. I was terrible at first. Like, really, really terrible... but I'll save that for my comparison post coming later this year, haha. But I kept working at it, and continued to shoot more and more portraits. Eventually I was trying to balance too much on my plate. I was attempting to shoot weddings, families, portraits, head shots, band promo, live music... I was spreading myself too thin and not really excelling in anything. Eventually some other photographic influences (I'll save their names for another post at another time. I want to keep this limited to the people I know personally in my life who had an influence on me :) ), convinced me to cut the fluff and concentrate on one or two areas at most. At first I thought portraits were boring. I wanted to do fashion photography, but I hated the idea of dealing with the fashion industry. And then I realized that there wasn't any reason I couldn't meld both worlds together, so instead of concentrating on being a "wedding-family-portrait-headshot-band photographer", I narrowed my focus to portraits. I still did music, because that was hard to let go of, since it was such a huge part of my pre-photography life, but I wasn't pushing it as hard in my marketing as I was my portraits. All the while I was attempting to find my style and fighting through terrible lighting set-ups, Krystal continued to inspire me with the way she was able to get her clients to connect to the camera and with each other. I was also impressed with how beautiful her photos looked taken with available light, and I decided that my "Strobist-only" mentality had to die. A good photographer knows how to use lights, but they also know how to work with available light, and I was terrible at both, but especially available light, haha. Fast forward to when Keith and I moved to Nashville. I had worked really hard to try to improve my photography as a whole, but I felt like I was in a rut. And then I ran into Matthew Simmons. Not only has Matthew become one of my best friends since I moved to Nashville, but he was and continues to be a huge source of inspiration for me. Matthew is mainly a commercial photographer here in Nashville, working with bands and artists. What I love about Matthew's work is that he's very technically capable. He's the reason I started paying more critical attention to my lighting, whether studio strobes, or available light. Before moving to Nashville, I used to throw up a light and get it close to where it should have been... but it was rarely exactly where it should have been. It wasn't until I started working with Matthew on his shoots, and he started working with me on mine, and I starting paying attention to exactly what he was doing with the lighting and what he was looking for, that I realized I had not been attentive enough in what I was doing. Not only is Matthew technically skilled, but he's artistically inclined, and it shows in everything he produces. He doesn't hesitate to create "outside of the box", and that often results in really stunning imagery. Even though we both have a different way of shooting and my images aren't as conceptual as a lot of his work, he's inspired me to break out of my comfort zone of producing the "safe" images I was conditioned to create by the mass amounts of people I was attempting to learn from previously. The past two years in Nashville have proven itself to be extremely beneficial for my growth. I've gotten exponentially better than I was before I moved here, and while I'm certainly not done learning and growing (a good photographer never really is), I'm super proud of my improvements thus far and thankful for all the people who have had a hand in helping me get to this point.